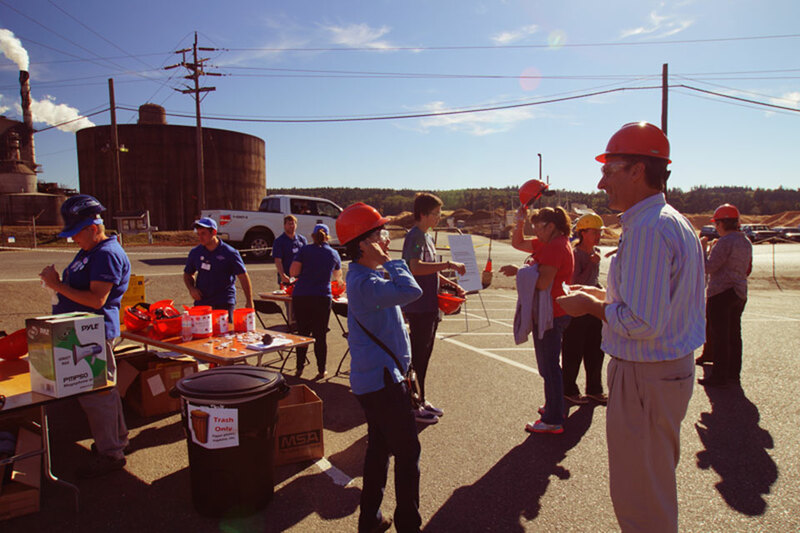 Port Townsend Paper Company » Open House 2014 — Thanks for Coming! Open House 2014 — Thanks for Coming! After countless hours of planning and organizing, brainstorming and button making, the Open House event we envisioned finally came to life. It was better than we could have hoped for—over 400 of our neighbors came out to hear talks about our operations and products, chat with our employees, and see the paper machines in action. While we wanted the day to be interesting and fun for our visitors, I don’t know if anyone predicted how rewarding it would be for us. To overhear our guests as they stepped back into the parking lot after their tour calling the experience “amazing” and “incredible”, or to see one of our employees deep in conversation, not just as a volunteer but as an industry expert, answering questions about our everyday life here at the mill—it reminded us why we wanted to open our doors in the first place. We can truly say that this event would not have been a success without the combined efforts of countless departments or without the friendly and curious community who turned out in droves to learn more about what we do. Thank you to everyone for taking part!